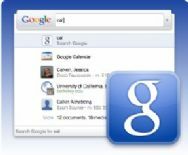 Google Mac Team members Nicholas Jitkoff and Dave MacLachlan have announced the release of a developer preview of a Google Quick Search box for the Mac desktop. Developed as an open source search box, the software lets you search data on your computer and across the Web. Billed as “very experimental,” the developers note the software supports contextual search, actions and extensibility. “It is by no means feature-complete, but is a very good indication of things to come,” they write. Users interested in experimenting with the new tool are able to download the app or build it from source code.